Gauhati Medical College and Hospital Result 2017 for Ward Boy / Ward Girl Exam Final Result under GMCH Guwahati Assam. 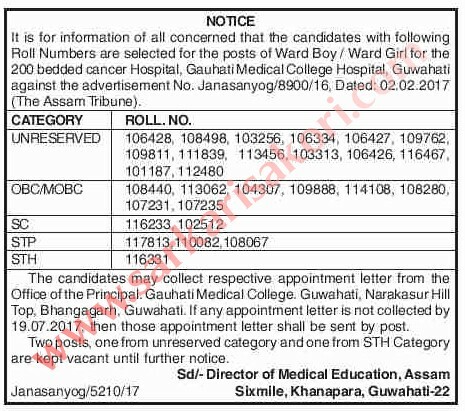 Gauhati Medical College and Hospital Result 2017 for Ward Boy / Ward Girl Final Selection List under GMCH Guwahati Assam for 200 bedded Cancer Hospital in Gauhati Medical College & Hospital. The candidates may collect respective appointment letter from the Office of the Principal, Gauhati Medical College, Guwahati, Narakasur Hill Top, Bhangagarh. Guwahati. If any appointment letter is not collected by 19.07.2017, then that appointment letter shall be sent by post. Two posts, one from unreserved category and one from STH Category are kept vacant until further notice. GMCH recently announced the Written Test Result of Ward Boy and Ward Girl which was held on 04-06-2017. All details about recruitment details and Result links are given below. Please check them carefully. Best of Luck to all the candidates who have successfully passed this examination. Qualification: Candidates must have read up to class VIII.